Industry Leader in Personality Clearances and Licensing Expands into the World of Elite Women’s Wrestling. WOW-Women Of Wrestling Champion Santana Garrett coming to posters, lunch boxes, and tee-shirts soon compliments of CMG Worldwide representation. 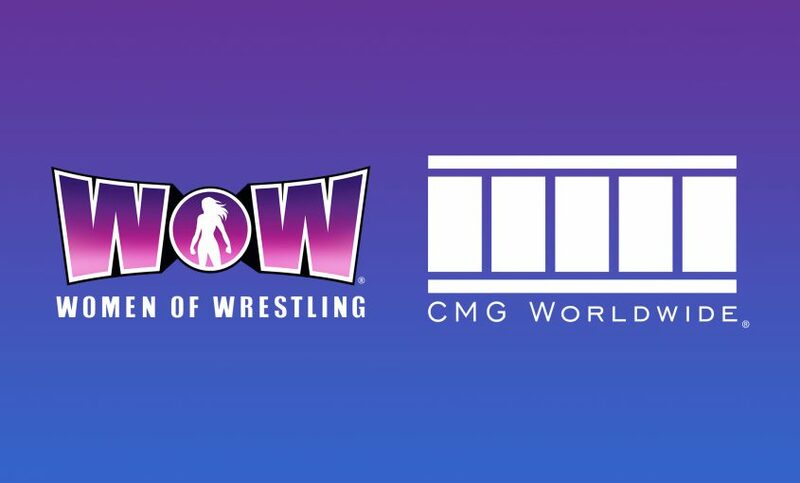 Los Angeles, CA – July 25, 2018 – Los Angeles Lakers owner Jeanie Buss has added the premier representation company, CMG Worldwide (“CMG”) to her team of WOW-Women Of Wrestling (“WOW”). CMG, headed by renowned Intellectual Property expert, Mark Roesler, represents over 400 of the world’s most famous personalities. CMG joins the WOW team that includes MGM Studios Television and Digital Group headed by Mark Burnett, Mark Cuban’s cable network AXS TV and the founder of the ‘80’s hit series GLOW, David McLane. Known for their legendary clients such as James Dean, Bettie Page, Rosa Parks and Amelia Earhart, CMG is expanding its roster to include more contemporary personalities by adding the WOW Superheroes to their prestigious list of clients. CMG is no stranger to professional wrestling, the company represents the estate of Andre The Giant and many other wrestling legends. WOW’s next event is the upcoming live television taping of WOW – Women Of Wrestling season six, which will debut on AXS TV in January 2019. Information on the date, venue and ticket sales of the live show will be announced soon. For more information about WOW and its Superheroes, visit http://www.wowe.com/ and @wowsuperheroes. WOW-Women Of Wrestling, the leading women’s professional wrestling organization, is owned by Jeanie Buss in partnership with MGM Studios Television and Digital Group and David McLane. It is the premier organization and content provider for live events and programming featuring women’s professional wrestling. WOW’s empowered women come from all different backgrounds and professions, and are marketed as WOW Superheroes, the main attraction of every WOW presentation. WOW’s current digital ecosystem, also known as “WOW World,” consists of its website, Facebook, Twitter, Instagram and YouTube channel, with broadcast on AXS TV starting in 2019. For more information about the WOW Superheroes, its villains, and its over-the-top characters, visit www.wowe.com.